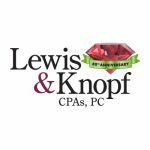 Lewis & Knopf, CPAs, PC is a mid-market accounting firm based in Flint, Brighton, and Fenton in Michigan. They provide accounting and consulting services, as well as bookkeeping, payroll support, QuickBooks troubleshooting, and more. Work For Lewis and Knopf, CPAs, PC? Claim This Page.